MTO250 series ohmmeters are readily portable mains-powered instruments that have been specifically designed to accurately measure the resistance of all types of magnetic windings. Typical applications include the testing not only of transformers, but also of shunt reactors and the windings of rotating machines. In addition, MTO250 test sets can be used for performing many other types of low resistance measurements. Validation of correct make-before-break operation of load tap changers is also supported and when this type of test is carried out, the instrument continually monitors transition currents, with high resolution, for each tap position, so that even slight discontinuities are detected and reported. These innovative instruments support the use of test currents up to 50 A, a feature which reduces the time needed to test high-current secondary windings by as much as ten times compared with standard instruments that have a maximum test current capability of 10 A. When the tests are completed, an integrated demagnetisation feature ensures that the transformer can be returned to service without risk of excessive inrush current or other problems associated with core magnetisation. 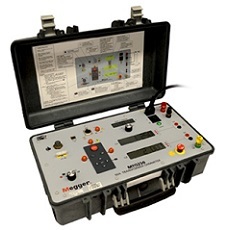 Among the many safety features built into the MTO250 as standard is an auto-discharge function that operates when the test is completed, in the event of power loss or if a test lead is inadvertently disconnected. A safety interlock circuit is also provided, together with provision for the connection of a strobe beacon to provide a visual warning that a test is underway. Internal data storage for test results is a standard feature, and the test sets can optionally be connected to a PC running Megger’s PowerDB software to provide full automatic control. To complement the new MTO250 transformer ohmmeters, universal Kelvin clamps with 100 mm adjustable jaws are available. These eliminate the need for multiple types of lead clips. Each Kelvin clamp also includes banana plugs for use on external probes for testing on terminal blocks.